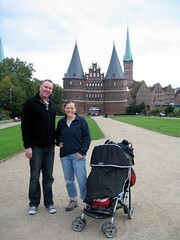 We trekked about 540km from near Eersel, Holland to Travemunde, near Lubeck, Germany. Here we met up with Travelling Piano Man Trevor! He is an old friend from way back….. who is now travelling the world playing piano and singing for a living! He organised a hotel for us and when we arrived at where he was playing – we realised why we were not staying there. The Hotel Arosa was very fancy and when we fronted up, in our cleanest jeans to the foyer to listen to Trevor’s gig that night, we felt pretty frumpy! Still, a beer for Dave and a fruity number (complete with umbrella!) for Narelle, and we were bopping along to Trev’s tunes quite happily. 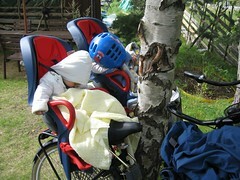 Charlotte was asleep in her buggy. 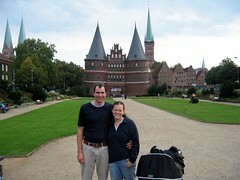 The next morning we met Trev for his famous tour of Lubeck! Well, not really famous, but seeing as he’d done it a few times before, we gave him the honorary title. We jumped on the train and headed into this very old town (about 20 mins away). We started at the front gates, which are very old and sloping pretty badly. 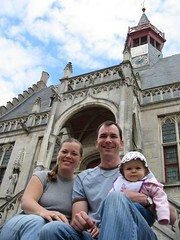 We visited a lovely old square, cobbled streets of course and saw a big cathedral. IT had been badly damaged in the war and the bells had been left where they fell when they were bombed. It was quite eerie. After a visit to the weirdest shop ever – a marzipan heaven (if you like marzipan!). You could buy anything here, made out of marzipan. Being German, they had every imaginable pork product (made out of marzipan!) mini ham legs, pork roasts, sausages, trotters, pig’s heads… the list goes on. We bought the customary piece of fruit (a strawberry) and a chocolate covered piece of marzipan (we had hoped the chocolate would disguise the taste of the marzipan!) and we sample our wares with a coffee on the square. Sorry Trev, but we are not converts! After a typical German lunch of sausage in a bun standing up at the s tall like the locals, we walked the streets in the glorious sunshine for a few hours. We went towards the bridge and on the way back (after coffee and cake of course!) we strolled the streets of the old town. We headed back to Travemunde for an early dinner at in Italian bistro, where the waiter spoke German to Trev and Italian for Dave and I! It was great! Thanks for a gret visit Trev, hope the rest of your touring goes well. See you in Perth some time next year. The day after our hospital trip the Spits family came to visit us at the campsite as arranged earlier in the week. 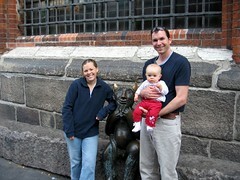 We met the spits family in Italy almost two months ago at Camping Arizona . The Spits family had heard of Camping Da Paal before but never been, so this was their chance to check out the campsite and to see Charlotte and us again. The weather was beautiful and we spent Saturday afternoon basking in the sun, whilst the children (and Dave) played in the giant sandpit adventure playground at Camping Da Paal. Special thanks to Linde and Mirthe for their lovely gifts to Charlotte – she loves her rattle and is always chewing on her new keys! 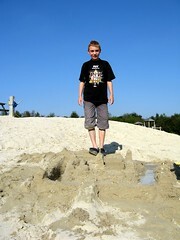 We learnt the Joris is not only the pancake king, but also – king of the castle. Sandcastles that is! Dave and Joris spent ages building their castle, with moat, church tower, townhall and of course – the palace! 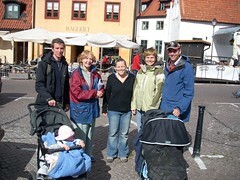 Gerdi, Narelle and Charlotte joined Linde and Mirthe (Artur was getting drinks!) – for the grand opening of the Joris and Dave Masterpiece. They used the water pump to flood their moat and it was successful (well, mostly!) in holding it’s water! There was bouncing on the trampoline and balancing on the big logs running from one side to the other of the sand dunes Linde and Mirthe were fearless and so quick! Narelle and Gerdi a little slower and more cautious! Plenty of fun for everyone! After drinks and some of Gerdi’s delicious home baked cake (something you can’t do in a camper!) we said our goodbyes… we hope to see you all again – perhaps in Australia – you never know! After Brugge in Belgium we headed back to our camper that was waiting patiently for us. Its amazing how it has taken three months of camping for us to get fully organised with the camper. We are finally at a balance of stuff that we have taken and it all seems to fit so well now. It was actually nice returning back to the camper although we did really enjoy the house in Brugge and definitely miss the toilet and kitchen facilities but we are only here for a week more. We have decided to stay put here in Camping Da Paal for a week longer as we have booked a house in Denmark for two weeks that starts on the 25th September and we are catching up with one of Narelles mates from Australia in Lubeck the weekend before. Have we mentioned that we really like Camping Da Paal? 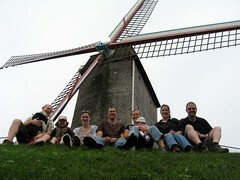 On the way home from Belgium we agreed to meet the Spits family whom we met in Italy at Camping Arizona <insert link>. 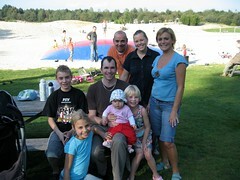 This family live in Einhoven which is a 20 minute drive from our campsite. 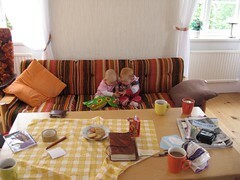 We had a nice meal of Soup and Pancakes (savory and sweet ones) and the girls had a really good but short play with Charlotte. We were late to dinner as we did not leave the house in Brugge until 5pm (Dave was helping with the house WiFi internet access and got caught up with a few technical issues). As we were late, we invited the family to come and see us at Camping Da Paal as they had always wanted to see the campsite (as they had heard of it before) and would love to see Charlotte (and us) again. 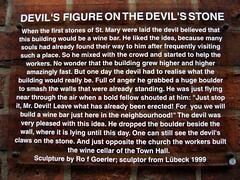 So we arranged for them to come on Saturday; the day before we left to go to Lubek in Germany. 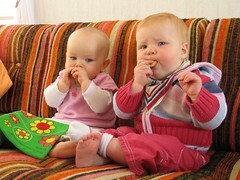 On the Friday before the Spits family were visiting, Charlotte decided that her breakfast (which consists of Porridge or Wheat-a-bix) wasn’t sitting right and threw up the remnants of her entire meal and when that was finished she kept on going and bile came up. With that her colour drained from her body and she became like a rag doll so floppy and tired. It was such a drastic change from little more than 30 minutes ago. We were in the Laundry doing our weekly wash, and Charlotte was supposed to be sleeping in the push chair, Charlotte had woken and Narelle decided that she would rock her a little to see if she would go back to sleep, as Narelle checked on Charlotte the vomiting started. Narelle rushed to reception where they made a doctors appointment for us while Dave got the car. The directions, that were written in Dutch, had been translated by reception so that we could find the doctors surgery. After examining Charlotte the doctor thought that it was just a stomach virus but was concerned about Charlotte being so floppy and her colour (she was very pale with a slight yellow tinge). So we were booked into the Veldhoven (MMC) hospital for some blood tests and checkup. At this point Charlotte was still vomiting she didn’t want any milk and she couldn’t hold herself up. After the doctors we headed straight to the hospital; thank goodness for Autoroute and the GPS unit that we bought before we left. The hospital care was great, we were seen to very quickly where they then organised for blood and urine tests. Charlotte was weighed and measured; she now weighs 6.84Kg and measures 69cm; her weight is still on the small side but her length is just below average for her age. After her blood test we all went to have lunch as it was now after two o’clock in the afternoon. 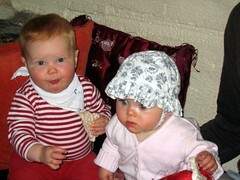 Charlotte took her first lot of milk since that morning and within half an hour she was returning to her normal self. She spoke to the doctor, started doing her waving and her colour was returning which made us all very happy. The blood tests came back normal as did her urine, she wasn’t dehydrated and there was no real concern for the cause of the episode. Within a few hours Charlotte was totally back to her normal self. After this ordeal Dave decided that as Belgium was only a 20 minute drive away that we should all go and have Belgium waffles, as we had done in Brugge. So with that we found a small town not too far away over the border where we found a small ice cream shop that sold fresh hot waffles laced with sugar, these things are so good! A long stressful day came to an uneventful end and we were all very happy about that. On the 13th September we headed from Holland to Belgium to Brugge (Bruges in English) to meet up with Scott, Ains, Peanut (Ains bump), Carl, Vick, Will and Dougie. We rented a very nice and very stylish 19th Century terrace house in the centre of Brugge with cobbled streets out the front and a very quite private canal at the rear, we were really in the old town. We had four days in Brugge and one of the things that we had decided to do after our bicycle experience in Sweden was to rent bikes and do some touring like the locals. We managed to track down a decent bike hire place that rented some modern looking bikes; one of the places we went to were renting out bikes that must be at least 25 years old, not that there is anything wrong with these it just that we are suckers for style and comfort. The guy at the rental store didn’t approve of Charlotte or Dougie to sit in the rear chair on the cobbles and said that they need to be at least 10 months old. And after touring around and giving Charlotte a very bumpy ride (once) we now agree with him, the cobbles are not young child friendly, so we ended up slinging Charlotte for the rough bumps as did Carl for Dougie. Once out of the city Charlotte did enjoy her time in the saddle. 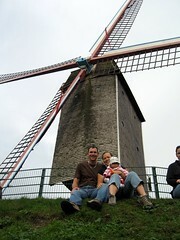 We headed to Damme which is about a half hour bike ride from Brugge. 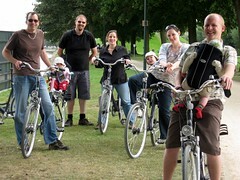 We had a packed lunch and the kids on the back as we headed out on the many bike paths that surround Brugge and Belgium. One part of the ride took us across an intersection that required a little nerve and probably some more bike experience than our few trips in the last four years; we just find that we cannot peddle in a straight line when we have to. 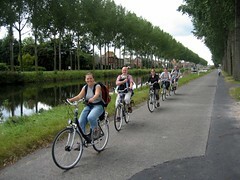 Anyway we made it safely through and the rest of the journey was by a canal that joins Brugge to Damme. A walk through Damme and we had our lunch in front of the town hall, sitting around the well that had more rubbish than water. A visit to a Church and a waffle in a cafe and the day was over it was time to return home. This trip to Brugge was a nostalgic tour for us as we were here last October when Narelle was pregnant with Charlotte (vomiting at every corner after each meal) so it was great to come back and remember the places we saw and the things that we did. 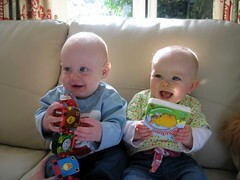 It was also great having other people to share it with us as we did last October. Dave, Scott and Carl went to a bar in Brugge that has 300 Belgium beers available for tasting, complete with menu and table service! After three beers at more than 6.5% it was time to have one last beer, the 20 year old vintage beer (brewed by Rose as we told by an English beer connoisseur sitting at the table next to us – we think he was legit as he really knew his beers and breweries but to know the brewer of a beer in 1987 is quite amazing even more so if it is true). The beer tasted like a vintage port, very smooth with an almost sweet taste, it was definitely one of those bottles to savor and sip enjoying every ml of the 750 that was in the bottle. Shared by the three of us it was a great end to a nice night out. The weather in Brugge for the four days that we were there was great the only rain that we had was on the last day where everyone had had enough of the tourist sight seeing and were content in buying some souvenirs such as Chocolate and one last street waffle that is laced with sugar and if that isn’t sweet enough for you then you can get it with Belgium melted chocolate (Scott we know you had one of these!). We all had a great time and would like to thank Scott, Ains (carrying peanut), Carl, Vick, Will & Dougie for making the journey from England to meet us. We left Germany for a four hour drive north to Holland (Netherlands) to a campsite called Camping Da Paal that had a special on for the entire month of September you could stay for €220! Which is the cheapest camping that we have had yet and not only this but it is the best campsite that we have been to so far on our trip! The facilities are clean and very modern and we only had a 20 meter walk to the bathroom. The bathrooms had family rooms with bath, shower and change facilities for babies. We were totally blown away by this campsite and it has restored our faith in camping although we are still tired of the cold damp weather but this site is so well run and so well provided for that we can put up with the cold and damp for a little while longer. The campsite caters so well for young families and the facilities on offer are incredible, they have a large indoor pool that is heated to 31 degrees as well as large out door pools. Inside there is a kids water playground that has water cannons, slides and games. There are two huge play areas that have all imaginable play equipment. Charlottes temperature hadn’t eased for almost three days, the medicine is reducing her temp but as the medicine wears off her temp returns. Narelle phoned a weekend help line for medical advice and was told that in Holland a 38.5 temperature is not high enough to worry about too much and that Charlotte needs three days to build up the anti-bodies that will eventually fight the infection (wherever that might be). It took another day before Charlotte started talking and resuming her normal self, the temperature was easing on Sunday without any medicine. This is the first time in our entire trip that anyone has been remotely sick and we think that Charlotte was just reacting to her two teeth that were coming through (yes she had two come up at the same time in the middle of her bottom jaw). Now we have to remember to brush her teeth as well as ours and we hadn’t started practicing before her teeth came up which meant that it took about four days of persuasion, singing, clapping and dancing before she would let us brush her teeth. We have enjoyed our five nights here so far, we are leaving the camper in situ while we go to Brugge and will return after our long weekend. 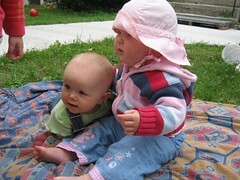 Here is a photo of some of the random affection that has been placed on Charlotte. This girl is 15 from what we can gather and wants to be a nurse, anyway we promised her that we would put her photo on the net so here it is. After Sweden we had four more nights in Germany, we really like the Rhine area and there were many castles and walks that we wanted to do. But the best plans never mean you actually get to do them. The weather was very poor, cold and wet and when the rain stopped we were too tired to get out and do anything major. In the end we decided that it was the campsite that was wearing us out. Our pitch was on the side of the hill in a very peaceful setting about 80 meters from the toilet blocks and general facilities; that doesn’t sound like a lot but it was a downhill walk to the toilets and at three in the morning when your bladder wouldn’t hold any longer the walk seemed to take forever. Also when you are tired and it is wet and everything is damp, the towels, clothes and tea towels were always wet each morning just from the wet air, our camping spirit was crushed. This is nothing against this campsite, in fact it is an amazing campsite and with the right pitch you get views of the Rhine and vineyards, the facilities are great and the showers are hot and free. It has great walks through the vineyards and forests; however we didn’t get one of the good pitches and maybe that was our mistake, choosing a pitch with shade (we still don’t know why we did this, just second nature after Italy we guess). 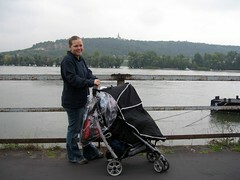 We managed a few trips into the local town Rhedeshime and we enjoyed walking along the Rhine. 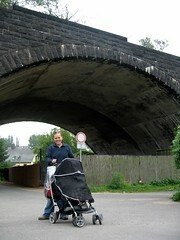 We saw the remnants of a bridge that was blown up in the second world war. The Rhine has many of these bridges and this is the reason that there is now a barge business in getting cars from one side to the other just as we had to do a couple of weeks ago. Our last day in Germany saw Charlotte finally push the two teeth that had been threatening for the past week through the gums, and as this happened her temperature hit 38.5! After reading some literature and talking to the manager of the campsite about doctors even he agreed that Holland would be a better place for medical treatment, so the nurofen was taking the temp away so we decided to see how she went in the next day or so which by that time we would be in Holland. The Rhine is definitely a place that we would like to visit again, but I think we will try and get there in better weather or stay in a bed and breakfast or similar; we are getting tired of camping now and looking forward to Brugge where we have a house booked. 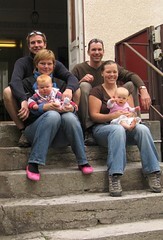 This is a special post for the very kind family (Schelgel’s) who gave up a seat for us on our flight back from Sweden. It was a very crowded plane and this very kind family shuffled a few seats for us so that we could all sit together. This was Charlottes fourth time in a plane and so far she has been very good. Mind you we have only traveled for 45 minutes on one flight and two hours on the Sweden – Frankfurt flight. We are still dreading the London – Singapore flight as this is fourteen hours! and Charlotte is just starting to crawl so it will be a very interesting…we will keep you up to date on how we go. It is a nice little campsite and with the cold wet weather here, it is lovely being indoors – complete with central heating! 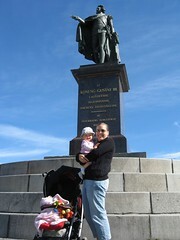 We have been into Stockholm twice and on Saturday we saw the Changing of the Guard. Well, sort of, we stood waiting for it to start and Charlotte decided it was lunchtime half way through it, so we left! Ciao to Enza whom we met there! Thanks for the email – great to hear from you! 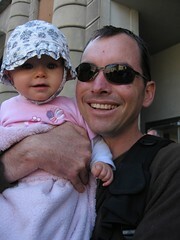 We fed Charlotte and wandered the streets of the old town. Dave had wandered off down the cobbled alley as I ducked into a children’s clothing store. Who happens to come inside the same store, as I was in there? Emma! She and Charlie had left Gotland that morning and were killing hours in Stockholm until their flight that night! Of all the people….s o you know what that meant….. time for coffee and more cake! 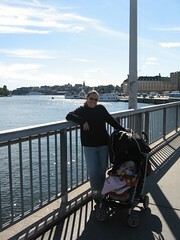 Stockholm is a great place – really clean and loads to see and do. Plenty of boating opportunities to get out and visit the Archipelgos – but the weather on Sunday when we planned to do it, was awful – so we did some more wandering around seeing the sights! Tomorrow (Tues 4th of Sept) we head back to Germany.